1. Lampre’s Michele Scarponi took the final stage and Liquigas’ Peter Sagan the overall title of the Giro di Sardegna Saturday after a 174-kilometer stage that finished atop a 5-kilometer dirt climb in Gesturi. For both riders, their impressive wins bode well for the next events on their programs. Sagan goes to Paris-Nice as an overwhelming favorite for the win—he took two stages in last season’s edition—while Scarponi heads to Italy’s Tirreno-Adriatico to avenge last year’s narrow loss to Stefano Garzelli. 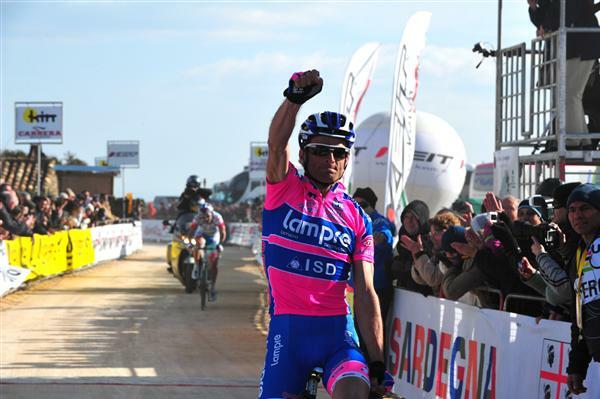 Scarponi’s win his first for Lampre, who took another important victory thanks to Damiano Cunego’s win in Stage 2. Cunego finished third Saturday and third overall as well, an indication that he might be back to his former, classic-winning self. 2. From Sardinia, the majority of the field went to Cagliari, Italy for Sunday’s Classica Sarda, where Sardegna-winner Sagan was forced to third on the day by Katusha’s Pavel Brutt—the first win of the season for the Russian squad. The final selection was a veritable who’s who of early-season stars including Sagan and Vincenzo Nibali (Liquigas-Cannondale), Robert Kiserlovski (Astana), Cunego and Francesco Gavazzi (Lampre-ISD), Emanuele Sella and Robert Ferrari (Androni Giocattoli), Oscar Gatto and Elia Favilli (Farnese Vini-Neri Sottoli), and Geraint Thomas (Team Sky). An aggressive finale ultimately produced a worthy-winner in Brutt, who took a 2-second win over Sella. 3. Meanwhile, in Switzerland, Saturday’s Gran Premio Regio Insubrica produced another candidate for the overall win in Tirreno as Italian National Champion Giovanni Visconti emerged victorious for Farnese Vini. Team Type 1’s Jure Kocjan was second—the young Slovenian’s fifth top-10 result of the season. 4. At the GP Lugano the next day, Liquigas’ Ivan Basso took his first win of the year, beating Geox-TMC’s Fabio Duarte. Visconti once again beat Kocjan to take the sprint for third. The victory has some people wondering if Basso’s a favorite for Tirreno, especially with an ITT closing out the race. 5. But any disappointment at Geox following Duarte’s loss was quickly consoled by Italian neo-pro Matteo Pelucchi, who won the field sprint at the Clasica de Almeria. It was the restructured team’s first win after a much-troubled off-season—and given the fact that Pelucchi was one of Italy’s most successful U23’s in 2010, expect more of the same from the talented, young speedster. 6. And last but not least, many were lucky enough to attend this past weekend’s 7th edition of NAHBS, the North American Handmade Bicycle Show. There was apparently much to see—for a terrific and thorough overview, head over to John Prolly’s Flickr page for photos and slideshows of pretty much everything that mattered. Thanks for your time and effort, John. From what I’ve seen so far, my personal favorites are Ritchey’s Swiss Cross and P-29er, Cielo’s CX Racer, and anything by Nick Crumpton. That about does it for this week’s Monday Musette. Come back later this week for the final two teams in our 2011 Season Preview, a season’s worth of International Cyclocross Awards, Valentin Scherz’s latest Letter from Abroad, and a few new features we’re sure you’ll enjoy. As always, share your comments below. This entry was posted in Featured, Musette, Races and tagged almeria, Basso, Bikes, cielo, crumpton, Cunego, geox-tmc, giro di sardegna, insubrica, lampre, lugani, nahbs, pelucchi, ritchey, sagan, scarponi, visconti. Bookmark the permalink. Hooooooonk – Pedant Alert: I think Geraint Thomas was riding for the GB squad (effectively the national track team; Clancy, etc), not Team Sky.